Last week I wrote about creating the map for my new campaign. Finishing the map (for now) wasn’t the end of my prep for this campaign, of course. Before I could even think about prepping the dungeons, I had to get down some details important to character creation. The first thing I did was give each of the settlements on the map their own skills and traits so the players could choose for their characters to come from those places. In a pinch, I could have just used the templates from the core book. Asktoft could just be a Busy Crossroads. But this is an opportunity to give the place its own character and feel. As I noted in my last post, I started a new Torchbearer game a few weeks ago. I’ve subjected this particular group to a number of playtests of new adventures recently, all of which have ended in TPKs. They’ve been good sports, but they were ready to commit to something longer term (with the hopes of actually surviving a dungeon or two). For my part, I wanted to get back to Torchbearer’s roots. One of the key ideas in my head when I first started working on the game was the idea of a map that would start with just a few locations and then grow over time as the group explored it and new details were added. That’s the core idea behind the Prepare Thyself chapter in the book. I decided that we would start the game in the Middarmark, specifically in the Gottmark of the far north because it’s been unexplored territory in our games so far. I went to my Middarmark map and selected the boxed part of the map below. Specifically, I think it’s the little saddle between the mountain in the southwest portion of the map and the hills above it. For me, the hardest part of making any map is where to start. I often find that picking an anchor geography point or points helps get me going. 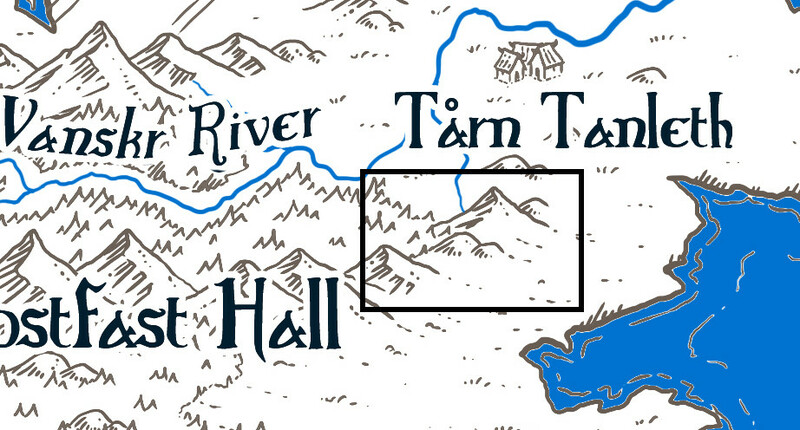 Part of what drew me to the section of the Middarmark map I chose is that big mountain at the top of the box. I chose that as my anchor point. I also know that I want to include Highwater (the port city from The Secret Vault of the Queen of Thieves). We’ll put it somewhere on the coast, though probably not on the initial map. That’s my second anchor point.